In the immediate aftermath of a national tragedy, the reaction of a president can set the tone for how a nation will heal and the magnitude of the scars that will remain. In the hours after the assassination of President Kennedy, that task was given to Lyndon B. Johnson. In Washington, Johnson found himself with the burden of moving a grieving nation forward. On November 23, 1963, (the day after the assassination) after viewing the fallen President’s body with other Congressional leaders, Johnson issued a proclamation declaring November 25, 1963, as a National Day of Mourning for President Kennedy. On that day, schools, businesses and government offices closed in observance. 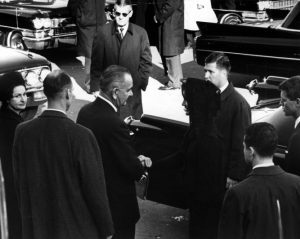 Many watched the funeral on television, while others followed Johnson’s call to attend memorial services. Johnson’s actions and words promoted feelings of continuity and unity. 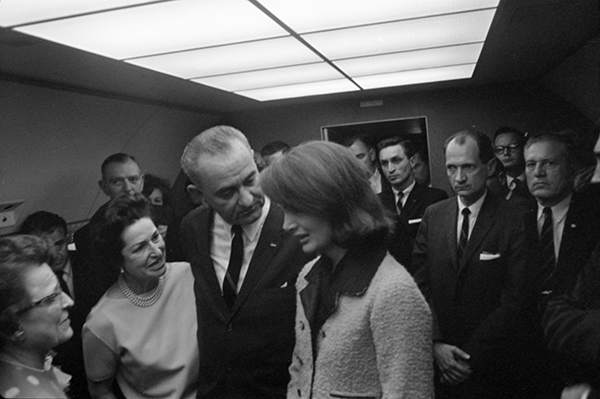 President Lyndon B. Johnson speaks with Jacqueline Kennedy as Lady Bird Johnson, Rufus Youngblood, Robert Kennedy, and others look on. One week after the assassination, on November 29, Johnson issued an executive order appointing a commission (Warren Commission) to “evaluate all the facts and circumstances surrounding such assassination, including the subsequent violent death of the man charged with the assassination, and to report to me its findings and conclusions.” Johnson believed it essential to provide the nation with a convincing explanation of why and how Kennedy was killed. “A troubled, puzzled and outraged nation wanted to know the facts,” he wrote in his memoirs. 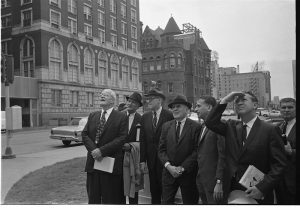 Members of the Warren Commission standing in Dealey Plaza at the corner of Elm and Houston streets, looking up at the sixth floor southeast corner window of the Texas School Book Depository building. 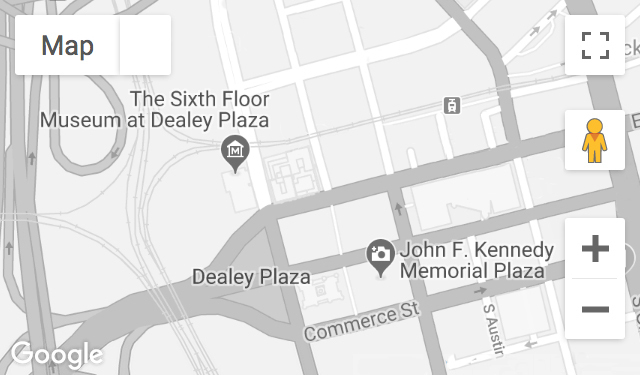 Ten months later in 1964, the Warren Commission submitted a report concluding that Oswald had acted alone and there was no evidence of a conspiracy. Johnson could not have predicted that despite his attempt to assuage the public with this investigation, the findings would ultimately exacerbate the nation’s wound and leave scars of suspicion and doubt in the minds of people for decades to come. 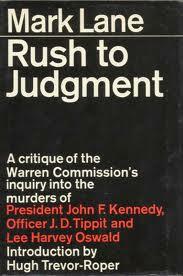 Written by American lawyer Mark Lane and published in 1996, this was the first mass-market publication to challenge the Warren Commission investigation. Visit the Museum’s Reading Room to learn more about the days following the assassination, Lyndon B. Johnson or any of the books mentioned.